All-Star Lineup of Stewart, Ganassi, Dixon, Andretti Confirmed for IMS Museum Spring 2019 ‘Distinguished Speaker Series’ – Reserve Your Tickets Now! The Indianapolis Motor Speedway Museum has an all-star lineup of legends set for its “Distinguished Speaker Series” in March, April and May, with Tony Stewart, Chip Ganassi, Scott Dixon and Mario Andretti set to appear. Inaugurated in 2017, each IMS Museum Distinguished Speaker Series event is a unique and unforgettable opportunity to hear from the most compelling legends, competitors and influencers in motorsports. Kicking off the 2019 series is “An Evening with Tony Stewart” on Wednesday, March 20, with IMS Historian Donald Davidson serving as emcee. 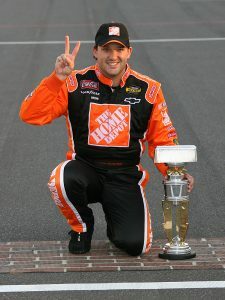 As a two-time Brickyard 400 winner; five-time Indianapolis 500 starter; three-time NASCAR Cup Series champion; IndyCar Series champion; IMS Hall of Fame member; team owner across multiple racing series and one of the most decorated racers in USAC history – and only 47 years old – the always-colorful Columbus, Ind., native Stewart will have plenty to talk about. NTT IndyCar Series team owner Chip Ganassi and reigning series champion Scott Dixon will appear together Wednesday, April 24 following an IndyCar Series open test that day on the Indianapolis Motor Speedway oval. Dixon celebrates 18 seasons driving for Chip Ganassi Racing in 2019, and he’s delivered a series-record five championships and the 2008 Indianapolis 500 to Ganassi, who himself was a five-time “500” starter as a driver in the 1980s and has earned 12 Indy car championships as a team owner. Mark Jaynes, lead announcer for NTT IndyCar Series radio broadcasts, will serve as host for the Ganassi-Dixon event. “An Evening with Mario Andretti” anchors the spring Distinguished Speaker Series, on Wednesday, May 22, hosted by longtime motorsports TV and radio host, Bob Jenkins. Andretti is a racing icon who began racing stock cars in Pennsylvania, the start of an illustrious career that saw him compete and win in every discipline he entered: midgets, sprint cars, stock cars, Indy cars, Formula 1, Formula 5000 and sports cars. He’s the only driver to win the Daytona 500 (1967), the Indianapolis 500 (1969) and the Formula 1 World Championship (1978), and Andretti won a total of 111 races in a career that stretched five decades and across six continents. Andretti’s Distinguished Speaker Series event will take place at the IMS Museum among a major exhibit opening May 1 that is dedicated to his life and career. Merchandise honoring the 50th anniversary of his iconic Indianapolis 500 win will be available in IMS Gift Shops. Tickets are $40 per event for IMS Museum members and $55 for non-members, with complimentary heavy hors d’oeuvres and a cash bar available. The Museum thanks our series sponsors: J-Cut Video, and Main Event Sound & Lighting. To maintain the exclusivity of each Distinguished Speaker Series event, seating is limited to 100 guests, so order your tickets soon to hear from these icons of motorsports! To purchase tickets, please contact Kelly Hartman at (317) 492-6568 or khartman@brickyard.com. IMS Museum memberships start at just $75 per year and offer numerous benefits. For information, contact Hartman or visit the Museum’s website at www.indyracingmuseum.org/join-and-give/membership/ . It is a nonprofit 501(c)(3) organization and relies on support from admissions, tours, sponsorships, annual memberships and planned-giving for its operations, educational programming, restoration and preservation efforts, exhibits and events. Located inside the famed 2.5-mile IMS oval, the Museum is open 363 days a year (closed Thanksgiving and Christmas).